Eating too much red meat has long been a no-no for people with high cholesterol and other risk factors for heart disease. But it hasn’t always been clear how much is too much. Now, a new study suggests that you don’t have to cut out red meat altogether to improve your heart health. If you eat red meat more than once a day, cutting back to one serving every other day can substantially reduce your risk of having a heart attack or dying from heart disease, the study found. That’s a “pretty dramatic increase,” says the lead researcher, Adam Bernstein, MD, a research fellow in the department of nutrition at Harvard School of Public Health, in Boston. Although the study included only women, Dr. Bernstein says he would expect the findings to be similar in men. 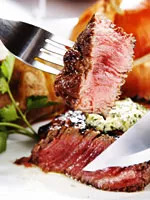 Some types of red meat appear to be worse for your heart than others. Eating one serving of beef per day only increases a woman’s heart-disease risk by about 8%, compared to eating it never or rarely. But eating one hamburger, one serving of bacon, or one hot dog per day ups a woman’s risk by 42%, 41%, and 35%, respectively, compared to eating those foods once or twice a month (if ever), according to the study. For instance, they estimate that swapping one serving of red meat per day for one serving of beans will lower a woman’s long-term heart-disease risk by about one-third. Replacing a daily serving of red meat with one of several other foods—including nuts (30%), fish (24%), chicken or other poultry (19%), and low-fat dairy (13%)—will also reduce heart-disease risk, the study found.